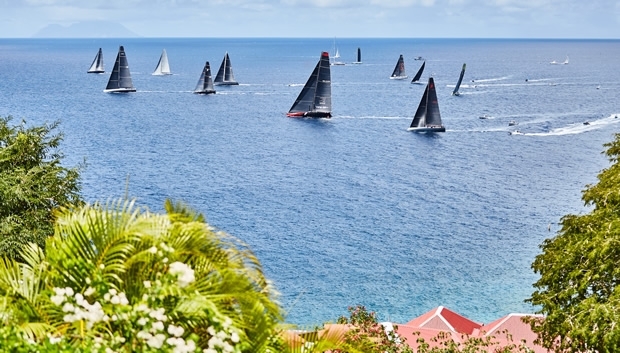 Exciting matches punctuated opening day action at Les Voiles de St. Barth, where nine classes competed in an awkward sea state and 12-15 knots of wind on courses, ranging from 24-31 miles, on the southern, western and northern sides of St Barth. In the six-boat CSA 0 class, where four TP 52s are sailing, Spookie – with the USA's current Yachtsman of the Year Steve Benjamin driving – was the undisputable winner of the start, shooting up to the pin end of the line at the last second with a burst of speed and a clear lane, which allowed the team to lead throughout the first beat and leeward leg. On the far side of the island, however, Jim Swartz's US entrant Vesper, which had started just behind Spookie, was able to pass them and, after sailing 31 miles, crossed the finish line six to seven boatlengths ahead. “The big picture is that it was a four-hour race that was decided by a few boat lengths,” said Swartz. “On the beats, it shifted back and forth several times. It was a very exciting race, a very close race. Vesper and Spookie are very closely matched boat-on-boat, and Sorcha, also a TP52, has an excellent rating here in the Caribbean, so they were able to come between us and Spookie (on handicap scoring) to take second place.” With that, Spookie settled for third overall, and the TP52 Conviction took fourth, followed by the Ker 51 Tonnerre4 and the Ker 56 Varuna VI. In the Maxi 1 class, the Maxi 72 Momo also managed a remarkable start, setting up similarly to how Spookie had in Class 0 and leaving its closest competitor, the Maxi 72 Proteus, close behind in disturbed air. In this case, however, Proteus could not catch up with the leader and finished almost four minutes behind, taking second place. Yesterday, Volvo Ocean Race winning skipper Ian Walker had explained that the mostly amateur crew on the Southwind 94 Windfall that is his ride here could win if the wind conditions were not too heavy or not too light. Today, he proved it when Windfall won the race, with Prospector, a Farr 60, following in second. The close match-up in this class was between the Volvo Open 70 SFS (which finished third) and the Volvo Ocean 65 Team Brunel (which finished fourth). Additional classes sailing today were for CSA 1, 2, 3 and 4, Melges 24 and Multihull. Racing continues tomorrow and resumes Friday and Saturday after a lay day Thursday.